The search for suitable vendors to assist in the commercial transport and destruction of Syrian chemical agents is due to begin tomorrow, the head of the Organisation for the Prohibition of Chemical Weapons (OPCW) said today, announcing a multinational effort for that will require additional funding. The goal, which OPCW Director-Genera Ahmet Üzümcü submitted in a plan yesterday to the Organisation’s Executive Council, is to transport the chemical agents to the Syrian port city of Latakia, where they will be shipped on commercial vessels provided by some Member States. They will then be loaded onto a United States ship and destroyed at sea using hydrolysis. It aims to destroy Syria’s chemicals outside of the country by 31 March 2014 and other mostly commodity chemicals by 30 June 2014 - in accordance with the decisions of the Security Council and OPCW Executive Council. He cautioned that time schedules have been disrupted by a combination of security concerns, clearance procedures in international transit, and even inclement weather conditions. As a result of the security concerns, the Syrian Government is responsible for the packing and safe transport of chemicals from the 12 storage sites to the port of Latakia and onto the maritime vessels. The Government also “will implement a security and safety plan during movement of materials within the Syrian Arab Republic,” said Mr. Üzümcü. In addition to a ship, the United States is to supply 3,000 container drums, as well as the loading, transportation and decontamination equipment and GPS locators, OPCW said. Russia will provide large capacity and armoured trucks, water tanks and other logistical supplies. China will provide 10 ambulances and surveillance cameras, while Finland has offered an emergency response team in case of accidents. Denmark and Norway are providing vessels and military escorts for the maritime transport of the chemicals, and subsequently for the transport of chemicals to be disposed of at commercial facilities. Italy has decided to offer a port for the loading of the priority chemicals from the Danish-Norwegian vessel to the US ship. The countries making these offers “in the interest of common good, assumed onerous responsibilities,” Mr. Üzümcü said. The Joint Mission will facilitate and coordinate the arrangements, and will also obtain the necessary assurances and arrangements. 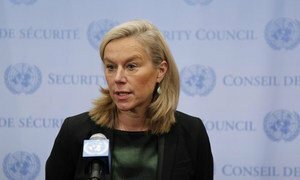 Preparations are proceeding for removing Syria’s chemical agents out of the country for their destruction, the head of the joint mission of the Organisation for the Prohibition of Chemical Weapons (OPCW) and the United Nations reported today, calling for continued support from the international community to complete this important task.